On one occasion, a competition was arranged among the gods for selecting the leader of the ganas (troops of demigods who are attendants of S'iva). Participants had to go round the world quick and come back to the feet of Lord S'iva. The gods started off on their own vehicles; the elder son of S'iva also enthusiastically entered the competition. He had an elephantine head; his vehicle was a mouse! Therefore, his progress was severely handicapped: He had not proceeded far, when Nârada appeared before him and asked him, "Whither are you bound?" The son was very much annoyed; he fell into a rage. For, what happened was a bad omen, doubly unpropitious for those going on a journey. It is inauspicious if the first person you come across when you are on a journey is a lone brahmin. Though the foremost among the brahmins (he was the son of Brahmâ Himself), Nârada was a bad omen! Again it is a bad omen if you are going somewhere and someone asked, "Whither are you bound?" Nârada put him that very question! Nevertheless, Nârada was able to assuage his anger. He drew forth from S'iva's son the cause of his predicament and his desire to win. Nârada consoled him, exhorted him not to yield to despair, and advised him thus: "Râma -the name- is the seed from which the gigantic tree called the universe has emanated. So, write the name on the ground, go round it once, and hurry back to S'iva, claiming the prize." He did so and returned to his father. When asked how he returned so soon, he related the story of Nârada and his advice. S'iva appreciated the validity of Nârada's counsel; the prize was awarded to the son, who was acclaimed as Ganapati. (Master of the Ganas) and Vinayaka (leader of all). S'ankara, the great âcârya, had four chief pupils: Throtaka, Hastamalaka, Sureswara and Padmapada. Of these, Padmapada was intent only on service to the guru; he could not pay attention to the lessons. The others used to sneer at him for his backwardness in studies. But his deep reverence for the guru made up for it. One day, he washed the clothes of his guru and dried them on a rock in the middle of the river; but, even as he was folding them, the river rose fast in a swirling flood; and he had scarce a foot-hold on the top of the rock. It was getting late; the guru would need the washed clothes soon; so Padmapada resolved to walk across, over the raging waters. He knew that the blessing of his guru would rescue him. It did. Wherever his foot was planted, a sturdy lotus bloomed and bore him on its petals. That is why he came to be called, lotus-footed Padmapada! The grace of the guru enabled him to master all knowledge and shine as a brilliant exponent of the ancient wisdom. Once a sadhaka, who had great ambition to know something about the divine, wanted his eye of wisdom to be opened. He entered a cave where a guru was residing. While entering the cave he saw a small light. As he moved forward even that little light got extinguished. In darkness one feels frightened, and in fear, we think of God very intensively. Thus he uttered loudly the word 'Namah S'ivaya' and on hearing this, the saint asked him who he was. He said that he had come to seek his grace. The great saint, who was sustaining himself in the cave only by breathing the air around him, had the competence to know the mind of his visitor. He said that he will answer his question later but asked him first to go and light the lamp, which had been extinguished. The visitor took a matchbox and tried to light the lamp but did not succeed. He told the guru that he had finished all the matchsticks and yet he had not succeeded in lighting the lamp. "In the vessel of your heart, there is the wick of your jîva. The wick has been immersed all these days in the water of your sensuous desire. Therefore you are not able to light the lamp of wisdom. Pour out all the water of desires from the vessel of your heart, and fill it with Namasmarana of God. Take the wick of jîva and dry it in the sunshine of vairagya; squeeze out of it all the water present in the form of desire and put into the heart the oil of devotion of Namasmarana. It will be possible for you to light the lamp of wisdom". There was an artist who had traveled far and wide and had built up for himself an extensive reputation. But so far he had not achieved access to Krishna! 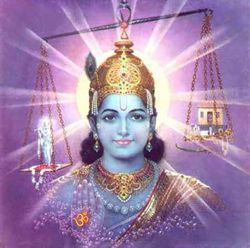 As much he was anxious to seek approbation from Lord Krishna as well. With his view, one day he got an appointment with Krishna, met Him and requested Him to stay still, so that he could paint His picture. He prepared the outline and told Krishna that he would get ready the final painting in a week's time. Krishna knew the ego of the painter. After a week, the painter brought a finished portrait, covered with a white cloth. In Krishna's presence, when he uncovered the painting, the painter himself was shocked at the lack of similarity between Krishna and the painting. The painter was completely surprised and asked for a week's time to get the job done: The painter tried several times but every time the result was equally disappointing. In complete frustration and total dejection, he wanted to leave the city and go away. When he was going away, sage Nârada met him. Nârada told him that it was silly to attempt to paint the picture of Lord Krishna. The Lord has no fixed form and He can change His face every second. Nârada advised, "If you do want to paint Him, I will tell you a method which will enable you to do so." Nârada whispered something into the ear of the artist. Following the advice given by Nârada, the painter came back, with a white cloth covering something and again approached Krishna and told Him that this time, He is welcome to change in any manner but the painting will look exactly like Him. When the cloth was removed, Krishna saw only a mirror and this mirror reproduced an exact replica of Krishna. If therefore, you are imaging that God is like this or like that, it is not correct. You cannot describe God and your attempts will fail. Make your mind clear and clean; fill it with love and devotion; that will enable you to have the true vision of God. On Saturday, a father was involved in worshipping the Lord and he called his son and told him to get some plantains for one rupee. This son was a good boy; he purchased the plantains, but on his way he saw a mother and son, who were very hungry, standing on the road. When the hungry boy saw the plantains, he ran towards him. The hungry mother, who saw the boy running, ran after him and caught him but both of them collapsed of hunger. When this young man found these people suffering so much from hunger, he thought that it was much better to feed hungry people than take the bananas home. He gave the bananas to this mother and son and later brought water and gave it to them. These people were so relieved of their hunger and thirst that they expressed their gratitude in many different ways and shed tears of joy. This young student went home empty handed and when the father asked him if he had brought the bananas, he replied in the affirmative. When asked where the bananas were, the son replied that the bananas were sacred, would not rot and could not be seen. The son explained that he fed two hungry souls with the bananas and the fruits, which he brought home, are only the sacred fruits of the action. The father then felt that his son was worthy of him and he felt that all his prayers had been answered that day. The father developed great affection for the son that day and they came much closer to each other. An individual took a watch, which was out of order to a watch-repairer. The watch-repairer said that the watch was very old and that it would cost a lot of money to repair the watch. He said that repair would cost at least two times the original price of the watch. The owner said that he would like the watch to be repaired even if it costs so much. The watch repairer thought that, since the owner was insisting on this old and worn-out watch being repaired, the watch was probably a lucky one. He replaced the old parts by new parts, repaired the watch and gave it back to the owner. When asked to pay the price of repair, the owner gave two slaps to the watch repairer. The persons standing by handed him over to the police and when the police asked him to explain why he beat the watch repairer, he said that he was asked to pay for the repair of the watch twice the price he paid originally when he acquired the watch and since he did not purchase it but got it by giving one slap to a person, he gave two slaps to the watch repairer. Our faith diminishes because our ambitions are limitless. There was a rich person who had a daughter with a flat nose. The father wanted to get this girl married. Every person who came and looked at the girl used to go away, although they were tempted by the wealth. In those days, persons who could perform plastic surgery were not available. In desperation, he announced that he would give plenty of money to anyone who would marry his daughter. The marriage was performed, and thereafter the couple developed considerable faith in God. They visited many temples, went on many pilgrimages and bathed in many sacred rivers. They met a saint who advised them that he, who created the nose, alone, could bring it back to normal. Although they had lot of wealth, they were not happy at all. The girl used to feel others were looking at her and making fun. She suggested to her husband that they should both go to the lonely Himalayas and spend a month there in that manner. He agreed and they did go. The girl had a great desire to get back her nose, so she began to pray to God in great earnestness. God appeared, due to her good luck, and asked her what she wanted. As soon as God appeared, she asked for the grant of a good looking big nose. God said, so shall it be and granted her the boon. As soon as God disappeared, she looked at her face. She looked at the big nose and felt that she had become uglier than before. She prayed again more earnestly and God appeared again and asked her what she wanted. She said that she did not want that big nose. God said, so shall it be and granted her the boon. She immediately found that her nose had completely disappeared. The moral of this story is that although God is present before you, playing with you and talking with you, you do not know what to ask. There is no one who does not love himself, has no belief in himself and has no ambition to rise higher and higher. Even a man who does not have faith in God has faith in himself and desires to have strength by which to cultivate faith in himself. There was once a guru communicating wisdom to people who came for his darshan with flowers and fruits. One day, as the offerings were plenty, he called a disciple and asked him to cut the fruits and arrange for its distribution as prasâda(m) . The disciple reported to the guru that all was ready for distribution and asked him who would be given first. The guru asked him to start with the person in whom he has the greatest faith and the highest confidence. All the people assembled there thought that the disciple would first give the fruit to the teacher and then distribute to the others. But the disciple did not do so. He took the first fruit himself. When the surprised onlookers asked for an explanation he said that since he had had the greatest confidence and affection for himself, he took the first fruit. There is a small story, which tells us how the possession of wealth will change the qualities of some people. A mother had only one son and a lot of money. The boy had lost his father early in his life. As the boy grew older and older, he got into bad company. If the tank is full, frogs gather but once the tank has dried up, all the frogs disappear. Many friends will gather round you so long as you have wealth and the moment wealth disappears, the friends will also disappear without telling you. The son of that wealthy person accumulated a large number of bad friends. He used to go to the mother day after day and demand large sums of money, with the result that the mother's affection towards the boy began diminishing and she developed positive hatred towards the boy. As days went on, the boy lost all attachment to the mother. She thought that it's much better that such a son who brings down the honor and reputation of the parents dies rather than lives and therefore she worked out a plan one day. At the same time, the son had its own plan as he thought that it is better that such a mother dies rather than lives. One day the son was to kill his mother with an iron rod as the mother came to serve him food. The mother also decided to kill the son the same day by poisoning his food. When the mother came to serve him food, the son hit her with the iron rod and killed her. A few minutes later, the boy also died after eating the poisoned food. There is a small story in the Mahâbhârata. With a view to get Krishna on her side, Satyâbhama, (see also: S.B. 10:58-32 etc.) one of his consorts, went to Nârada and requested him to tell her some way, a short-cut by which she can achieve her objective. Nârada knew that Satyâbhama was very selfish and that selfishness will never work in matters relating to God. Nârada wanted to teach a lesson to Satyâbhama and said he knew of a method which would get Krishna on her side, a ritual in which she gives away her husband as a gift to someone and then buys him back by paying money, equivalent in weight to the weight of the Lord. Nârada said that Krishna will belong solely to Satyâbhama under all circumstances if she went through this ritual. Satyâbhama was lured into the plan. Therefore, she did the ritual of gifting Krishna to Nârada and then getting Him back. In one pan of the balance, she made Krishna sit and she put all her jewels in the other pan but it was no match to the weight of Krishna. Nârada saw an excellent opportunity in the situation and told Satyâbhama that since she is not able to give gold needed to equal her husband's weight, he was taking away Krishna and that from that day, Krishna would not belong to her; He would belong to him. We know that King Janaka [see also B.G. 3:20-21 & RRV-7a], even while performing ordinary worldly duties like ruling the kingdom and looking after the needs of the kingdom, found it possible to turn his thoughts completely towards the divine. The great rishi S'uka was once teaching several things to his disciples in a forest quite close to Mithilapura. Janaka learnt about this and wanted himself to become a disciple of S'uka and listen to his teachings. Janaka went to the forest, made obeisances to S'uka and asked that he be accepted as one amongst the numerous disciples S'uka had, and requested for permission to attend the classes. From that day, Janaka was conducting himself as one of the disciples. One day when he did not arrive in time, S'uka did not start his class and waited till Janaka arrived. He further told the other disciples that he was delaying the class for that reason. When the sage told the other disciples to wait till Janaka arrived, they murmured amongst themselves and told each other that they had joined this great sage only because it was believed he attached no special importance to kings and other powerful people. From that day, their faith in the guru started weakening. They also became envious of King Janaka. As soon as S'uka saw such envy and jealousy among his disciples, he decided to teach them a lesson. At an opportune moment, all the disciples were made to feel that the entire city of Mithilapura was in flames. Then each one of them began to think of the consequences, of the effect it would have on their houses, and ran to the city to salvage what they can. But King Janaka did not waver or move from his place. S'uka told Janaka that the flames appeared to have spread to the palace and he asked Janaka to go and save the inmates of the palace. Janaka was only smiling, thinking that God's will shall be done and no one can change it. The envious students who ran to the city found that there were no flames at all and it was only a make believe. They came back and reported this to S'uka. They expressed surprise at the steady mind of Janaka. S'uka looked at the disciples who were envious and told them that it is better to have one disciplined student rather than many who have no stability of mind. A king used to ask three questions of all people who came to him. The first question was: 1. who is the best of persons? The second was: 2. what is the best time and the third, 3. what is the best of all actions? The king was very anxious to know the answers to these questions. One day, he went to the forest and was moving about the hills and plains. He saw an 'âs'ram' and wanted to take some rest there. By the time the king reached the âs'ram, a sadhu was watering some plants. The sadhu saw that the king was rather tired, stopped watering the plants, ran up to the king and gave him some fruits and cool water. At that time, an individual wounded all over the body was brought to the âs'ram by another sadhu. As soon as the sadhu saw this, he went to the individual, cleaned all his wounds and gave him some herbs which could cure the wounds. He was also telling him sweet words which could console the person. The king wanted to express his gratitude and take leave of him. The sadhu blessed the king but the king was still troubled by his three questions and wanted to see if the sadhu could enlighten him on that matter. The sadhu stated that the answers to the three questions were contained in the actions which the king had witnessed in the âs'ram. The sadhu said that when the king came to the âs'ram he was watering the plants and that was his duty. At that time, on seeing the king the sadhu had given up his duty and come to the king and gave him water and fruit. This was in accordance with correct traditions, as the king was his guest. While relieving the king of his thirst and suffering, another injured individual had come to the âs'ram and therefore the sadhu had given up the duty of serving the king and went to the other individual and began serving him. Whoever comes seeking service from you is the best individual at that time. Whatever satisfaction you can give him by serving him will be the best work you can do. The present, when you can do something, is the most sacred of all times. One got into the habit of eating opium. It was not possible for him to control this habit. He was always in a kind of coma. A saintly person visited his city and was offering advice and comfort to many. The opium-eater also sought the advice of the saint. The saint said that his health was deteriorating and that he should give up eating opium. At this, the opium addict said that it was not possible for him to give it up. He requested the saint to give him some advice. The saint asked him how much of opium he used to take every day and was shown a certain lump as the quantity being taken every day. The saint got a piece of chalk, equal to the lump of opium and told him that he may continue eating opium but should not take more than the weight of the chalk each day. The opium eater was quite happy but he was also told that every day he should write 'OM' three times on a blackboard with that chalk. In this manner, the chalk was reduced in size every day and so the amount of opium which the person was eating also got reduced gradually and ultimately this habit was removed. The first and foremost of my directions is: Revere your parents, especially the mother. There was once a place, which was hit by a hurricane so wild that all the houses were razed to the ground, and people had nothing to eat and nowhere to lay their heads. Among the worst hit were a mother and her two sons. The elder bow was a gem of virtue; he felt responsible for the safety and care of the family; he loved his mother, and sought to win her love and blessings, more than anything else. The mother with the younger child was going out begging and keeping alive on the little they could get from the famine-stricken land. Soon, she found that she was too weak even to walk a few steps and so, the elder son had to go begging, all alone, to feed the family. He said, falling at her feet, he would do what she was doing and collect food for all. He wanted that she should not over-exert, and worsen her health. How could three live on mere handfulls? The son too was rendered weak. With faint voice and fainter steps, he moved towards a zamindar's [mogol name for leaseholder in India to collect taxes from peasants] house and called out for a morsel. The lady of the house called him in and led him to a plate whereon she served some food. But he tottered into an upright position, and fell plump on the floor. The zamindar came running into the room and placed her ear near the dying boy's mouth, so that she could catch the last words that emerged from his lips. He was saying: 'No, no! First she must be given food. My turn comes next'. You may be able to pay back any debt; but, the debt you owe your mother, you never can repay. Those who claim to be devotees of God must have this credential; they must revere the mother! Once, Krishna pretended to be suffering from headache, intense, unbearable headache! He acted that role quite realistically. He wound warm clothes around His Head and rolled restlessly in bed. His eyes were red and He was in evident distress. The face too appeared swollen and pale. Rukminî, Satyâbhama and the other queens rushed about with all kinds of remedies and palliatives. But they were ineffective. At last, they consulted Nârada and he went into the sick room to consult Krishna Himself and find out which drug would cure Him. Krishna directed him to bring - What do you think the drug was? - the dust of the feet of a true bhakha! In a trice, Nârada manifested himself in the presence of some celebrated bhaktas of the Lord; but, they were too humble to offer the dust of their feet to be used by their Lord as a drug! That is also a kind of egoism: "I am low, mean, small, useless, poor, sinful, inferior" - such feelings also are egoistic; when the ego goes, you do not feel either superior or inferior. No one would give the dust wanted by the Lord; they were too worthless, they declared. Nârada came back disappointed to the sickbed. Then, Krishna asked him, "Did you try Vrindâvana where the gopîs live?" The queens laughed at the suggestion and even Nârada asked in dismay, "What do they know of bhakti?" Still, the sage had to hurry thither. When the gopîs heard He was ill and that the dust of their feet might cure Him, without a second thought they shook the dust of their feet and filled his hand with the same. By the time Nârada reached Dvârakâ, the headache had gone. It was just a fiveday drama, to teach that self-condemnation is also egoism and that the Lord's command must be obeyed without demur, by all bhaktas. The gopîs had the highest type of bhakti in their hearts. There was Neeraja, for example. She was warned against Krishna, when she came to Brindavan from a distant village as the bride of a gopa. In spite of all warnings, however, she saw Krishna during the Govardhana festival and when she saw Him, she surrendered her heart to the Lord. She passed through great ordeals on account of this spiritual attachment, but she bore it all with courage. She had seen Krishna first at the foot of the Govardhana hill playing sweetly of the flute. So she used to go often to that bower where she first saw Him, to inhale the holy air. She was the foremost among those gopîs who tried to curb the horses that drew Akrûra's chariot with Krishna in it, away from Brindavan to Mathurâ (see also S.B. 10:39). She suffered silently the separation for years and years, until one day when she was exhausted with the agony, Krishna appeared before her in the self-same bower, where she was. She had one request to make, she longed to hear the divine flute, before she died on Krishna's lap. The Lord said, "I have not brought it", but, just to grant her the boon, He broke a length of reed from the bower, made it in a trice into a flute and played on it a tune that melted Neeraja's heart into tears, which washed her soul away. It was her maternal love that prompted her to send her husband Kuchela [Sudâmâ ('giving well') was called Kuchela as he was always wearing clothes in tatters; see also S.B. 10:80] to the Lord so that her children might get a full meal. She had faith in the Lord. Kuchela hesitated and argued that Krishna might not recognise him or remember him or invite him in or accept his homage. She urged him to give up all doubt and proceed at least as far as the gate of the palace of Krishna. She was certain that Krishna would call him in, if he took at least that little trouble. Kuchela was so nervous that he could be persuaded to go only up to the gate. Once it was decided that Kuchela would go, she took from the place where she had hidden it for a rainy day, a quantity of paddy, just a handfull; she put it in boiling water, took it out, dried it and, then, frying it over the fire, she pounded it with a pestle to prepare the "beaten rice" that Kuchela said was Krishna's favourite food, while at school. That was tied to a corner of the cloth worn over the body and he moved on, his fear increasing at every step. Such fear should be absent in the genuine bhakta. He must approach the Lord as of right and earn the grace that is his due. Of course, the Lord showers his mercy on the aartha and arthaarthi, as well as on the jijnaasu (seeker of wisdom) and the jñâni (spiritually wise man). The aartha is the person who is ill and suffering; the arthaarthi is the poverty-stricken who seeks prosperity and fortune. So, he called him in, with overwhelming joy, and reminded him of the happy days at school which they had spent together at the guru's feet, and even while Kuchela was squirming to hide the commonplace offering tied to the corner of his tattered cloth, Krishna sought out the stuff and began eating it with great relish. Bhakti had made it very tasty to the Lord. It is related that Rukminî devi held His hand when He took the third handful and the reason given usually by commentators is that she was afraid all the riches of the Lord would go over to Kuchela if a few more handfuls were taken in by the Lord! What a silly idea! As if the riches of the Lord are exhaustible, as if He would care if bhaktas carried all of it away, as if the Mother of the universe is stingy in Her gifts, this can never be true! The real cause for Her holding the hand of Krishna was: She claimed Her share of the offering of the devoted heart; She wanted a portion for Herself; it was Her right to have a share. Kuchela left Dvârakâ rather disappointed, because he was not given any donation or promise of a donation. He was sad, when he remembered his family and the starving children. He was lost in grief and so, he passed his own house without noticing that it had undergone a great change and had become a huge big mansion overnight. His wife, who saw him, called him back and related how suddenly, happiness had been showered upon them by Krishna's grace. God is so merciful that He will come ten steps towards you, if you but take one step towards Him. Vibhishana (see RRV 6b), the brother of Râvana, inquired from Hanumân whether Râma will accept his homage and take him under His protecting shade. Vibhishana said: "I am the brother of His worst enemy, whom He has vowed to destroy; I am a member of the demonic race; I am unacquainted with the Vedas or S'astras or the rituals of the Âryans". Then Hanumân replied: "O you fool! Do you think He cares for ritual correctitude, or family status or scholarship? If so, how could He accept me, a monkey?" That settled the matter. Vibhishana was assured of grace. When he went to Râma later, He asked the elder monkeys around Him whether He could accept Vibhishana into the fold. Of course, He did not need any counsel from anyone. He was never influenced by others. But, still, just to bring them into the picture, He consulted them and made a pretence of not having made up His mind yet. When Sugriva (see RRV-4a) said "no", Râma reminded him that he too had come to Him, first, giving up his elder brother! When Lakshmana said that the only treatment he deserved was to be thrown back into Lankâ, Râma said, "Yes! I am resolved to crown him as the emperor of Lankâ, after the demise of Râvana". Whoever surrenders, Râma accepts, on the spot, without reservations. When someone suggested that Vibhishana should not be promised a throne, for, Râvana may fall at the feet of the Lord and earn pardon for his iniquity, Râma replied, "In that case, I will hold both hands of Bharata and beg him to make Vibhishana Emperor of Ayodhyâ, our ancestral domain; we both, Bharata and I, will spend our time happily in the forests". Âryans: Literally: noble. Follower of Vedic or spiritual path. Ancient dwellers of India who composed the Rig-Veda; the chief tribe was that of the Bharathas.